Cups that overfloweth are a good thing. Landfills, not so much. 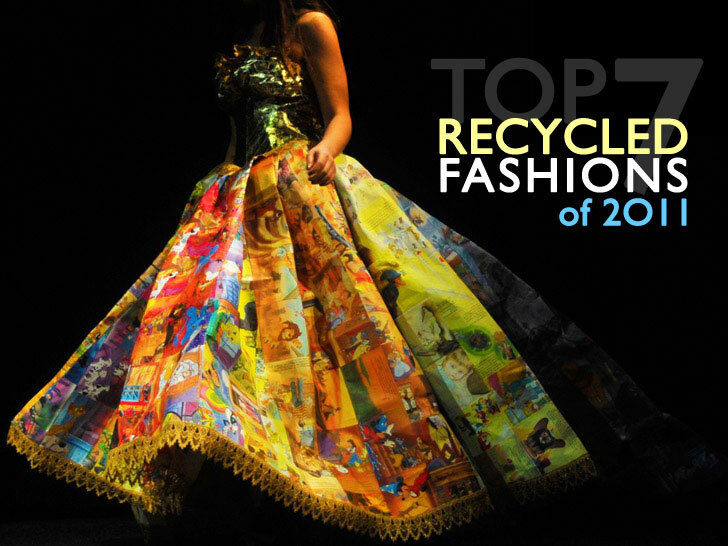 From jewelry made from discarded footballs and dumpster-bound plexiglass to floor-sweeping gowns derived from vintage children's books and repurposed plastic water bottles, here are seven recycled garments and accessories that are giving our burgeoning rubbish heaps some measure of respite. Have a favorite? Sound off below! We couldn’t include all our refashioned favorites. Visit our archives for any stories you may have missed. After discovering tiny, diamond-shaped wood chips on a workshop floor at Kingston University in London, Stefanie Nieuwenhuys scooped them up and set to work, layering the wooden scraps onto fabric like reptilian scales. The result? An arresting "biomimetic" collection of corsets, floor-length evening dresses, trousers, and neckpieces that marries modern laser-cutting techniques with a couturier's delicate yet exacting touch. Rumplestiltskin couldn't have done a better job spinning recycled plastic bottles into "gold." Royal College of Art student Florie Salnot worked with Saharawi refugees in Algeria to create faux precious-metal accessories using little more than hot sand, a “nail board,” and paint, providing not only a model for revitalizing declining local crafting traditions but also a sustainable source of income. Michelle Brand isn’t your typical wedding-gown designer, but then again, “Green With Envy” isn’t your typical wedding gown. Trailed by a 16-foot train and weighing more than 22 pounds, the gown is the sum of 2,220 recycled plastic-bottle bases, 6,512 plastic-bottle tops, 13,880 tags, and months of tireless labor. The wedding dress, which debuted at Britain’s largest inner-city shopping center in April, wasn't just a sly nod to the Windsor-Middleton nuptials. It was also designed to encourage shoppers to nix plastic bags in favor of reusable totes. Merriment and boozy afterglows aside, music festivals also generate a prodigious amount of trash. Lisa Våglund, a recent graduate of the Danish Design School, pitched a solution, transforming discarded tents from the Roskilde Festival—one of the six biggest annual music festivals in Europe—into stage costumes for singer and festival staple Kissey Asplund. After discovering a cache of discarded plexiglass on its way to the landfill, metalsmith Heather Studstill decided to transform the hard, clear plastic into baubles fit for a fancy soiree. The collection, which was inspired by geode-hunting “out West” as a child, marries hand-carving techniques with gold and silver leafing for extra sparkle, with no two pieces exactly alike. Avid football fans won’t be caught offside with these repurposed necklaces by Swiss jewelry artist, Noémie Doge. Derived from old footballs from different corners of the world, each of the worn leather hexagonal pieces are crafted into unique necklaces that were once used by kids trying to bend it like Beckham.